Medical laboratory technologists (MLTs) play a critical role in the health system by performing lab tests on blood, body fluids, cells and tissues – nearly half a million in Ontario each day. A blood sugar test to diagnose and monitor diabetes...a biopsy to check for cancer…prenatal testing to detect genetic diseases– these and thousands of other tests performed by MLTs provide the results other health professionals need to deliver the best care. 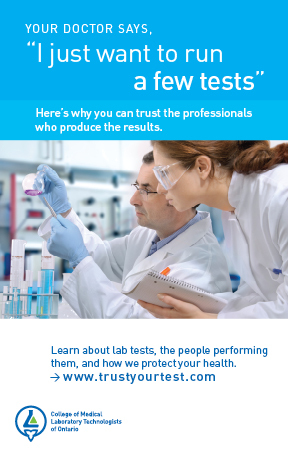 In December 2009, the CMLTO launched a public awareness campaign designed to explain the role of MLTs, generate confidence in the professionals who produce lab test results, and reinforce the College’s role in self-regulation and public protection. Every MLT is a regulated health care professional as mandated by the Regulated Health Professions Act, 1991. Regulatory Colleges, such as the College of Medical Laboratory Technologists of Ontario (CMLTO), exist to protect the public interest and ensure the highest standards of medical care through regulation of health professions. MLTs meet strict safety and ethical standards and are held accountable for their conduct and practice, so the public can have confidence in their lab tests.